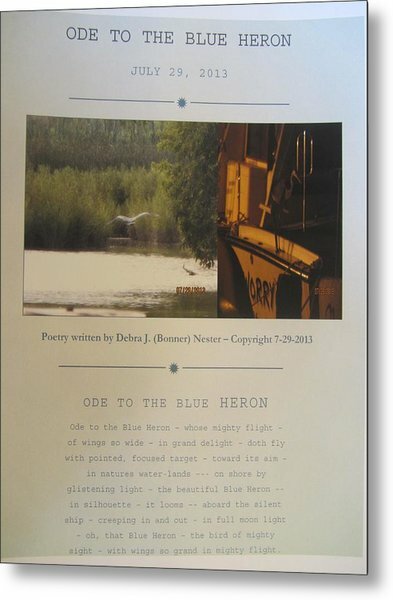 Ode To The Blue Heron is a photograph by Debbie Nester which was uploaded on August 23rd, 2013. There are two photographs of the Great Blue heron on this Fine Art, and I wrote the poem entitled "Ode to the Blue Heron," about the Great Blue Heron in the two photographs. 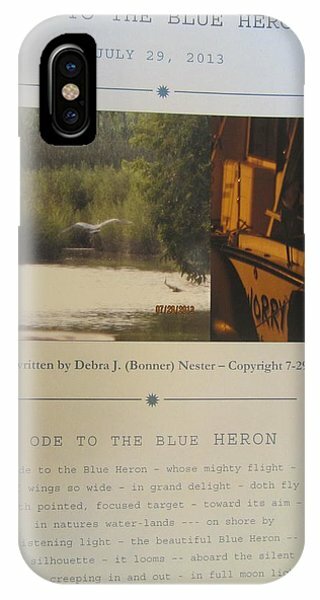 I wanted to see a Blue heron with its wings wide open, and I wanted to see one at night doing its thing. The next morning, after I took the two photographs I decided to write a poem about the Great Blue Heron. I hope you enjoy it! I should have put a dash after the word "aboard" to indicate a pause there, and there should be an emphasis on that word. "Ode to the Blue Heron" is posted the way I intended it to post, like a page in a book, slightly curving so as to begin to look at the next page. Like my Fine Art, there are many pages to our lives. I hope to publish a book of the poems I have written over the past 5 years or so. Maybe I'll make this the cover of my book of Poetry, hopefully published soon. For now, it is offered as a Fine Art piece only. It is an achievement I wanted to share with you and so did by putting it here as Fine Art Photography with Poetry. Qurious as it may be, it is a glimpse of what the human mind can achieve - I wanted to see a Great Blue Heron wings wide open, flying, and I wanted to see a Blue Heron going on a boat at night to see what it does, and I did. I also wanted to write a poem about the Blue Heron - I did, and I put them together to create something to share with you to brighten up your day. It is a curiosity, but a thought led to it's creation. "As we think, so shall we be." Our inner desires become manifest in reality, beginning with a thought. "Out of the stillness..."
This Fine Art piece is supposed to have white on all but the left side as it is supposed to look like a page of a book just beginning to open. Please bear with me as it now shows the wong orientation even thoughit was uploaded right side up. The PDF still doesn't look right. I will try reloading it. Reposted at right orientation and lower price. Thank you for your patience. 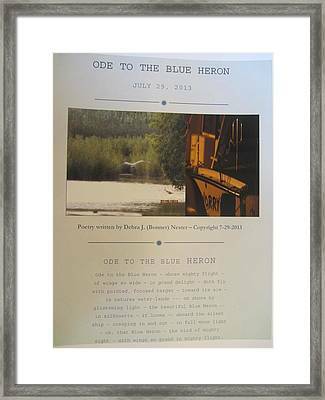 I will be leaving the dates on: the date I wrote the poem, the 29th of July, 2013, and the dates on the two photographs. This is an original poem I wrote, and the type of Poem is an "Ode;" thus, the title "Ode to the Blue Heron." 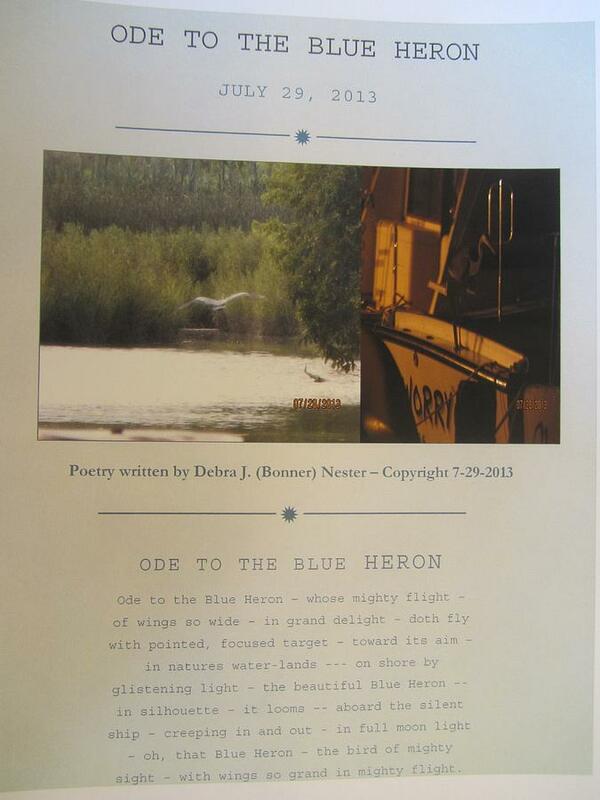 I will be reposting "Ode to the Blue Heron" at the right orientation. Thank you for your patience. Debbie To go to Debbie's Reflections Fine Art Gallery on Fine Art America and Pixels.com type in Google or Bing or simular search bar: www.debbie-nester.fineartamerica.com and click on my site. The white is supposed to show on the top and bottom.